This is one of my most favourite quilts – EVER – and today it came home after being with the publishers for the past few months. This is one of those quilts which I envisioned, designed, made, and every time I look at it, I smile. It just makes me supremely happy. a firework quilt and honestly, from the moment I imagined it in my mind, I was hooked. I called it “Baby, you’re a firework’ after my daughters favourite song by Katy Perry. She really likes this quilt and wants it for her bed. Luckily for me, it’s only a lap size quilt, and its too small for her bed. I love, love love this quilt and it will hang on a wall, somewhere in my home… after I add a hanging sleeve that is. 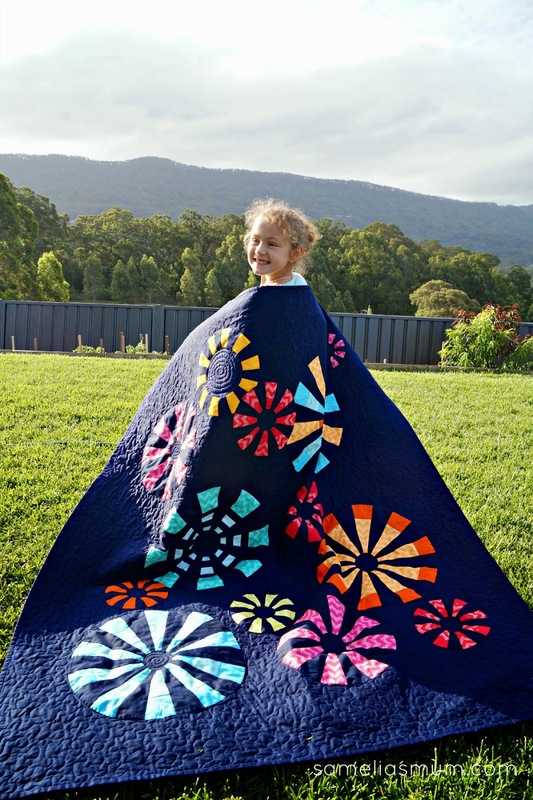 This quilt pattern is available in the new issue of Patchwork & Stitching Magazine in Australia. It is on sale from today. Doesn’t it look pretty right there on the cover? For anyone internationally who may be interested in this pattern, I’ll make it available soon. That's so beautiful. Great quilt!! Beautiful... What child doesn't like fireworks! I'm actually contemplating a little more quilting on it. Yes, I am crazy like that! Just awesome! Thanks for sharing this beauty! Thanks Debra. I’m really pleased with it. My magazine arrived today. Love the quilt. Thanks Linda. I haven't received a copy of the magazine yet. I'd best go down and buy one today to make sure I have it. Oh I love it!! So very special. You made a beautiful quilt and pattern. I love how the colors pop against the navy.